As a very promising new data model, constraint database is attracting a growing interest recently. For better applications, we need to study its design theory. 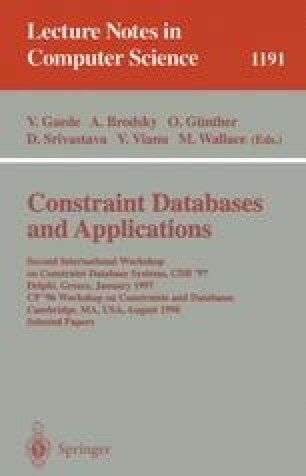 But to the best of our knowledge, no papers about the design of constraint databases could be found. So we hope to extend the well-developed design theory in relational databases to constraint databases. We introduce the notions such as variable independence, functional dependency, decomposition, lossless join and canonical form, etc. in the context of constraint databases. We present an algorithm to compute the canonical form of a dense-order constraint relation over a variable set, which preserve a variable independence of every generalized tuple and prove its correctness. Our main result is to prove that the existence of variable independence and functional dependency under some conditions, can decide whether a dense-order constraint relation scheme has a lossless-join decomposition. Our work provides basic theoretic results and an algorithm for the scheme design which is central in the design of dense-order constraint databases.